The current organization environment continues to evolve as companies increasingly focus on culture and leadership as a competitive advantage. Organizations feel the effects of increasing competition, cost-consciousness, and the necessity to serve customers better. Companies expect employees to maximize contributions-in leadership, customer care, business processes improvement, and knowledge-to deliver the organization's value proposition. Organizations expect these contributions at a time when they are fundamentally changing in size and in strategies. These organizational demands are creating profound implications for the human resources function and human resources executives. Mike Horne, and his team, assists clients to accelerate the attainment of goals. Along with our clients, we're charting courses that transform visions into realities. We're comfortable in the boardroom, the executive suite, the conference room, and the classroom. 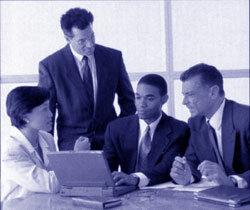 We provide a comprehensive range of strategic services on issues of concern to CEOs, HR executives and other leaders. Successful client engagements occur through collaboration, competency, and consideration of multiple stakeholders' interests. We respect and value client autonomy. Leadership Acts Group is a pragmatic choice for returning measurable outcomes quickly for client organizations. We are flexible in our approaches, adapting to an organization's specific constraints, needs, and opportunities. We have provided services to leading organizations, including: Business Objects, Darden Restaurants, Exxon Mobil, Gap Inc., Hewlett Packard, Interwoven, Marriott International, Office Depot, and others. We develop unique and lasting relationships with clients and distinguish our activities from other planned improvement strategies and solutions, using a behavioral science base to create distinctive outcomes. Please visit us at Leadership Acts Group.